A measure of a liquid’s ability to resist shifts to lower (acidic) pH values. Alkalinity can be composed of carbonate, bicarbonate, and/or hydroxide as well as borate, silicate, phosphate and other bases. Reported as milligrams per liter calcium carbonate (CaCO3 ). Combining a metallic ion with an organic substance (such as EDTA – ethylenediaminetetraacetic acid – or perhaps with naturally-occurring aquatic humic substances). By doing so, the metal stays in solution and may be ‘bio-available’. A chelated substance can also be called complexed. Cobalt is an essential trace element for algae, some bacteria and animals (but not higher plants). Cobalt is a transition metal and is found at very low concentrations (0.003 to 0.4 ppb) in natural seawater. Copper is an essential trace element for plants and animals. By law, copper cannot exceed 1.5 mg/L in 10% of homes served by larger potable water systems. Copper levels can exceed this maximum allowable limit when aggressive (corrosive) water degrades copper piping and fixtures. Copper is a transition metal and low concentrations are toxic to invertebrates and is often found in natural seawater at concentrations of ~0.001 to 0.01 mg/L. This is a technique used to break down a substance into components that can be analyzed. Digestion usually involves exposing the substance to high temperature and strong acids and is necessary in order to accurately access concentrations of metals chelated with organic substances. However, vigorous digestion is not always required in order to estimate total metals (such is the case for Hach’s iron and copper chemistries). Iron is absolutely required for growth and well-being of plants and animals. The EPA has set a secondary limit (suggested, but not enforceable) on concentrations of iron in drinking water at 0.3 mg/L. High iron concentrations in drinking water can cause staining of plumbing and clothes as well as impart objectionable taste and color to food. Iron is a transition metal. Ocean water contains 0.002 to 0.02 mg/L iron. Manganese is an essential element for plant and animal growth. Its concentration should not exceed 50µg/L (U.S. EPA secondary standard for potable water) and elevated concentrations can stain plumbing, cooking utensils and clothing. Manganese is a transition metal. Previous research suggests manganese can be effectively removed by GFO. Seawater contains 0.001 to 0.01 mg/L. Milligrams per liter, essentially the same thing as parts per million (ppm). Nickel is suspected to be an essential element for at least some plants and animals. The EPA has established a primary, enforceable limit of 0.1 mg/L in drinking water. Nickel is a transition metal and naturally occurs in seawater at ~0.0001 mg/L. Hach’s reagents allow determination of cobalt and nickel through analyses of a single sample. Since the protocol did not include spiking of samples with nickel, it is not surprising that nickel levels fell below the detection limit of the instrument (data not shown). The intensity of the acidic or basic character of a solution. Phosphorus occurs in water almost exclusively as phosphate (PO43-). Excessive amounts of reactive (or ortho-) phosphate encourages algal and plant growth but can be a limiting nutrient at low concentrations. Phosphorus is essential to all living organisms. Phosphorus is a non-metal. Silicon is required for proper function by some plants and animals. It is used by diatoms to produce skeletons and is sometimes not included in the formulation of artificial seawater. There is no limit established by the U.S. EPA on silicates in drinking water. Silicon is a metalloid. Zinc is an essential element for growth in plants and animals but elevated levels may be toxic. The U.S. EPA has established a level of no greater than 5 mg/L in drinking water. Deterioration of galvanized pipe and brass fixtures can add zinc to drinking water and can cause a bitter taste. Zinc is required in the genetic make-up of every cell and is an absolute requirement for all biologic reproduction including DNA and RNA syntheses. Zinc is an integral component of about 200 metalloenzymes, including carbonic anhydrase, superoxide dismutase, alcohol dehydrogenase, carboxypeptidase, glutamic dehydrogenase, lactic dehydrogenase, and alkaline phosphatase as well as hormones. Zinc is a transition metal and has been shown to be adsorbed by GFO regardless of the solution’s ionic strength. 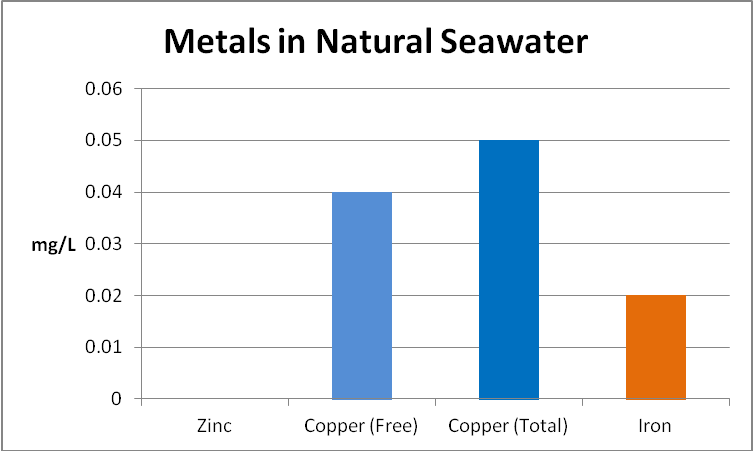 Zinc is found in seawater at a level of ~0.005 mg/L. Most instructions for use of iron-based materials used in phosphorus removal will caution the end-user of potential drops in aquarium water alkalinity. Figure 1. Effects of GFO on alkalinity (as mg/L CaCO3). As expected, alkalinity was affected by the addition of GFO (see Figure 1). 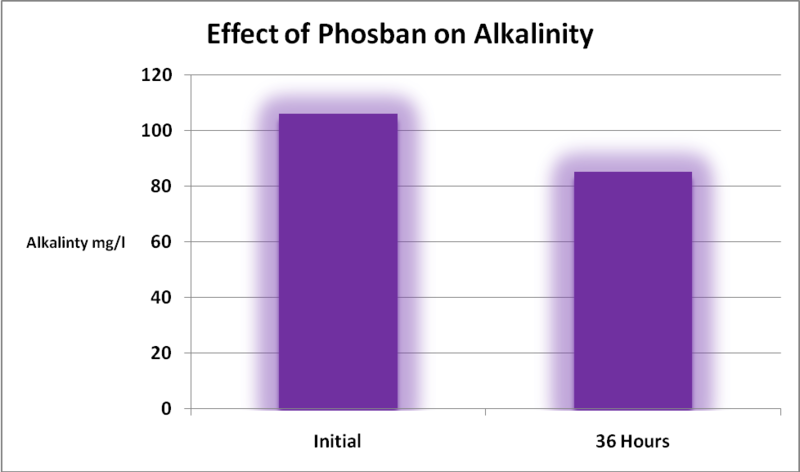 Hobbyists should be aware that many substances will impact alkalinity levels, including two that these GFO products removal effectively – phosphorus and silica! Cobalt is found in natural seawater at parts per billion concentrations. Under the conditions of this procedure, cobalt (likely only free cobalt) is actively removed by GFO. See Figure 2. Figure 2. Cobalt concentrations fell after GFO was introduced. Copper in an aquarium is a double-edged sword. It is an essential trace element but is toxic at higher concentrations. 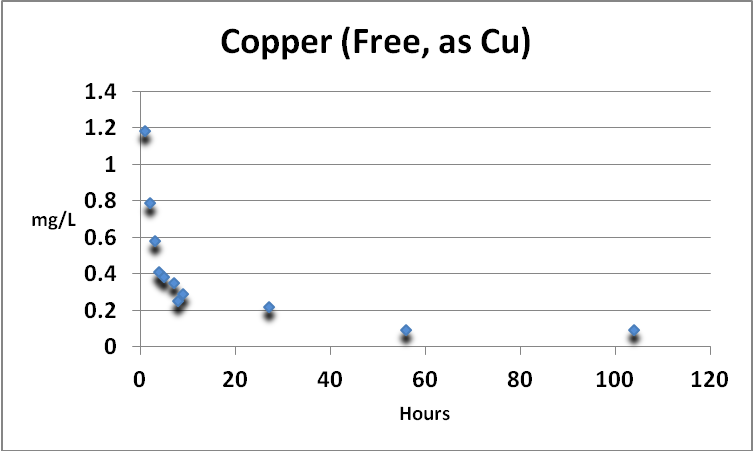 Free and total copper were determined. See Figures 3 and 4. Figure 3. Free copper removal by GFO. The Detection Limit of the test is 0.02 mg/L as Cu. The final reading (0.09 mg/L) is still above that usually seen in natural seawater. Total copper is the sum of free and complexed copper. Figure 4. Total copper fell due to removal of free copper by GFO. 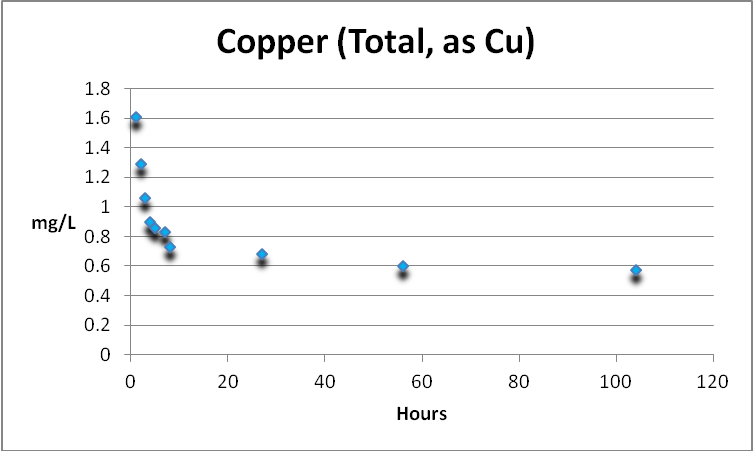 Copper, complexed with organic substances, can be determined by subtracting free copper from total copper. Figure 5 shows complexed copper is weakly removed, if at all, by GFO. Figure 5. 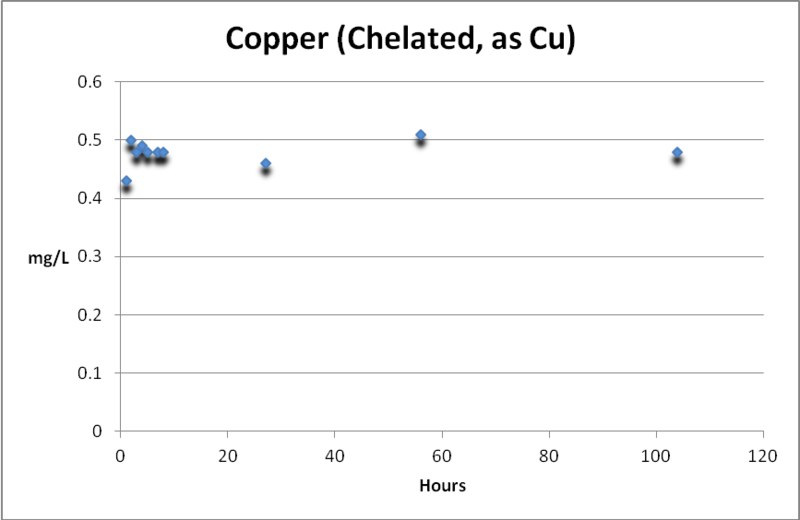 Chelated (complexed) copper is very weakly removed by GFO, if at all. Since iron is a major component of GFO, and this substance is subject to weak grinding action within a fluidized reactor, it might be expected that the iron content of the aquarium water would increase, and indeed it did. Further analyses found the iron to be almost entirely in the ferric form, but perhaps more importantly, as mostly in the form of suspended particulates and not dissolved. See Figures 6 through 9. Figure 6. Experiment #1 showed total iron initially rose and then fell. Figure 7. 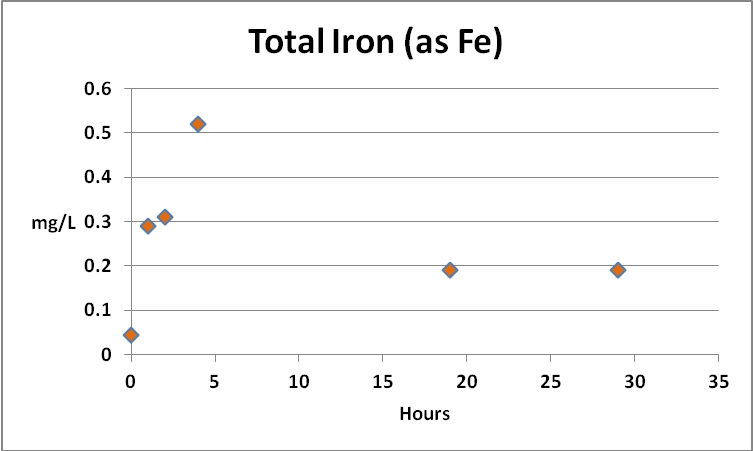 Results of experiment #2 found total iron concentrations rose and fell very much like that seen in experiment #1. Figure 8. 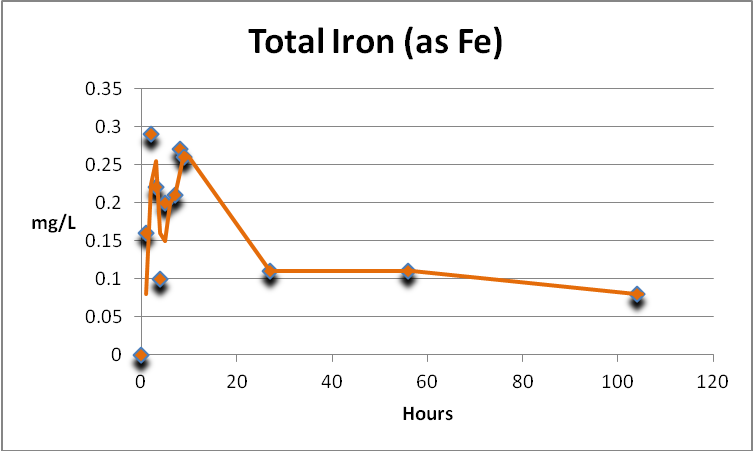 Total iron minus ferrous iron equals ferric iron. Figure 9. 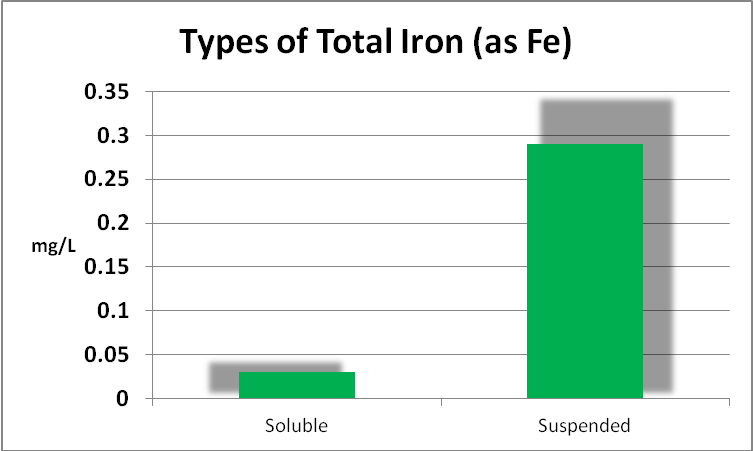 Very little of the total iron was soluble but instead found in the suspended form. Manganese is an essential element for plants and animals. 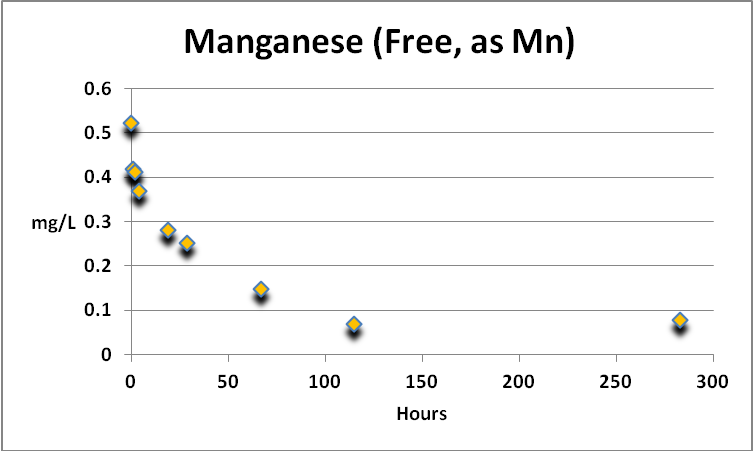 Free manganese is actively removed by GFO, although the concentration of manganese in the spiked sample plateaued at ~0.07 mg/L at about 120 hours and thereafter. See Figure 10. Figure 10. Manganese was actively removed by GFO. The analytical procedure can report Mn concentrations of 0.006-0.7 mg/L, while natural seawater contains ~0.001 to 0.01 mg/L. GFO is advertised to effectively remove silica, and testing confirms this. 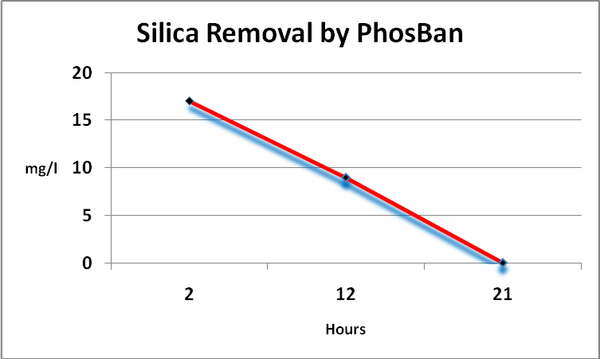 Silica is quickly and effectively reduced in concentration, as its concentration fell to below the detection limit of the testing device (in essence ‘zero’). See Figure 11. Figure 11. Silica concentrations fell to below the detection limit of the instrument (essentially zero) inn less than 24 hours under the conditions of this experiment. Zinc (free and not complexed) is rapidly removed by GFO. At 104 hours, the concentration had fallen from ~6mg/L to 0.38 mg/L (a removal of ~94%). See Figure 12. Figure 12. The Detection Limit of the analytical device is 0.02 mg/L as Zn. pH (the intensity of the basic or acidic natural of a substance) is known to be influenced through use of GFO. Figure 13 demonstrates this effect. Figure 13. Use of GFO can cause rapid shifts in pH. As with many elements, phosphorus is essential for life but can cause problems – specifically that of enhanced algal growths – at relatively low concentrations. Hobbyists should be concerned with reactive or ortho-, phosphate as this is the form that fuels algae growth (this is the form most all ‘test kits’ report). On the other hand, total phosphorus is that bound with other substances and requires a specialized digestion process including heat and an acidic environment. See Figures 14 and 15. Figure 15. 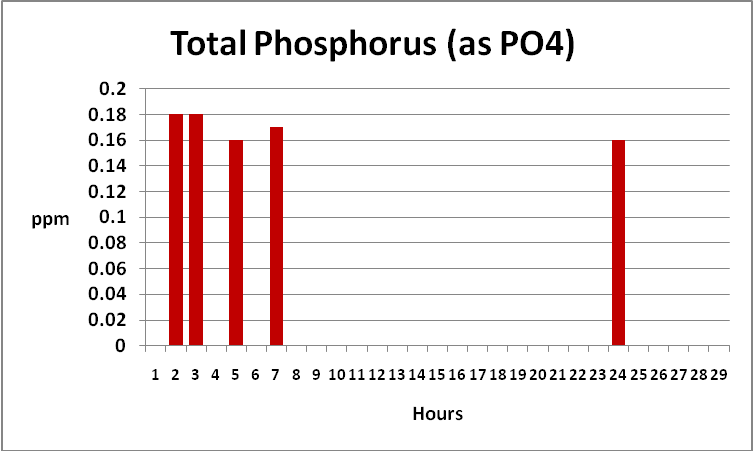 …reactive phosphorus from total phosphorus, we find total phosphorus concentrations remain static. 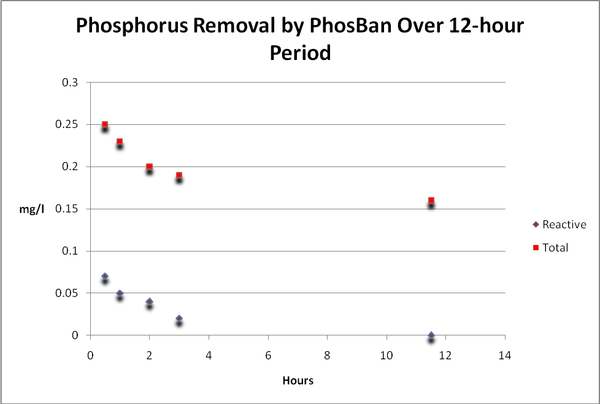 Total phosphorus is weakly, if at all, removed by GFO. This form of phosphorus is likely organically bound in suspended particles. Redox, or ORP, is the tendency of an aqueous solution to gain or lose electrons from the introduction of a new substance. Redox measurements of a few natural reefs here in Hawaii are not substantially different than those taken during this procedure (See Figure 16). Figure 16. 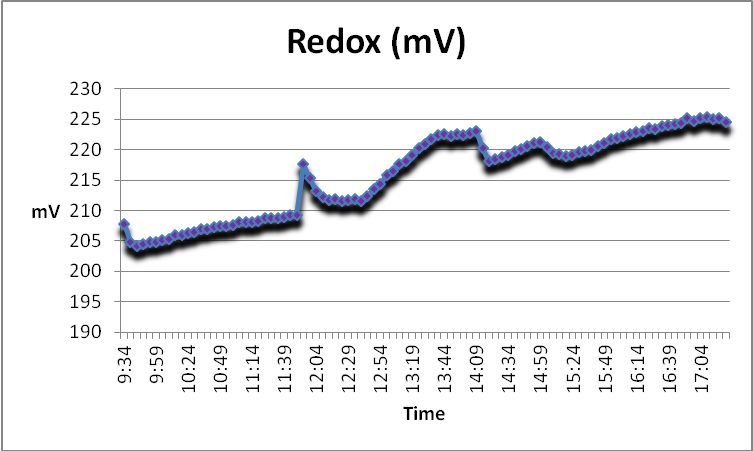 At the first use of GFO, the redox value of the water trended upwards (the procedure began at 12:39 pm). Addition of various metals to an aquarium can result from a number of factors ranging from inadvertent to deliberate. However, two likely account for most input: Feeding and water top-off and/or water changes. We’ll examine these in some detail: Fish Food: Many hobbyists, if asked, might say they do not deliberately add copper to their reef aquaria. The truth is that they do in the form of fish food. Prepared fish foods often contain trace amounts of copper sulfate, ferrous sulfate, manganese sulfate, zinc sulfate and potassium iodide. Tap Water: Tap water may be from surface water (rivers, lakes), ground water (wells) and in some cases catchment (captured rain). Water quality varies with location, and elevated levels of nitrate, lead, copper, iron, manganese, calcium, magnesium and others may require pretreatment before release from the water treatment facility. In many parts of the country, water receives little treatment before distribution to customers, with disinfection (via chlorination, fluoridation or ozonation) being common. Small and private water systems are not regulated by the EPA, although guidelines have been established. Larger water systems are required to provide annual Consumer Confidence Reports (CCRs) that state levels of contamination if present. Bear in mind that clean water does not like to stay that way and often picks up contaminants from the plumbing within your dwelling. Reverse Osmosis (or nano-filtration): Reverse osmosis is a popular means used to remove contaminants from water. Removal efficiency depends upon many parameters including type of pretreatment used and the type of reverse osmosis membrane used. In most all cases, removal of contaminants by RO filtration is not complete and small percentages of contaminants found in feed water are not removed. De-ionized (DI) Water: DI water is often the most pure of waters regularly added to an aquarium either as that used to mix artificial salts or as top-off water. Functioning cationic/anionic de-ionization units can delivery water suitable for making dilutions when testing for various substances. Conductivity of DI water is low – mine produces water of just 4 or 5μS.cm2 Obviously, DI units can import little metals. Well Water: Well water is naturally enough groundwater and is subject to absorbing any number of inorganic and organic substances in the soil. Private or small water systems using well water are not regulated by the US EPA and it is up to the owner(s) to determine suitability of this source for drinking or any other use for that matter. Impurities in Supplements: We tend to think of the supplements added to our aquaria as being relatively pure when I fact they are not. For instance, ‘laboratory grade’ manganese chloride (ACS, 99.5% purity) contains 0.001% zinc and iron at 1.7 ppm. Technical-grade chemicals may be around 95% pure. Natural Chelators: Aquatic humic substances are generally those produced by aquatic plants and algae either by biochemical pathways or through their decay. These substances can combine with metals in solution and cloak them from detection with most test kits used by hobbyists. Artificial Chelators: Artificial chelators such as EDTA or EGTA can bond with metals. One major artificial seawater -Instant Ocean – advertises to contain no EDTA or any other metal chelators (see www.instantocean.com for details). All benthic objects are surrounded by a thin layer of stagnant water called the boundary layer. Its thickness is determined by the amount of water motion around the object, and is inversely proportional. In other words, the layer of stagnant water decreases when flow increases, and vice versa. Diffusion of elements through the boundary layer is related to the concentration of the substance in solution – the higher the concentration, the less likely it is to be limited by diffusion rates. The carry-home message is clear – insufficient water motion within a coral reef aquarium is to be avoided and directly affects the availability of ‘trace elements.’ Most aquaria do not even come close to ‘natural’ water motion where, in my experiences, sensors mounted to 5-pound lead weights can be tossed about by passing waves in even sheltered coves. A water sample was collected in the littoral zone at the 4 Mile Marker on Alii Drive in Kailua-Kona, Big Island of Hawaii. This island is geologically young and metals bound in lava rock are leached by acid rain (a mixture of volcanic ‘vog’ -volcanic smoke containing tons of sulfur dioxide- and water vapor). The amount of copper found in natural seawater is roughly equivalent to that reported in the County of Hawaii drinking (ground) water Consumer Confidence Report (see Figure 17). This report does not include concentrations of iron and zinc. Figure 17. Concentrations of copper and iron at the 4 Mile Reef in Kailua-Kona, Hawaii. There is likely a terregenous impact from acid rain leaching through geologically-young lava rock. A brief review of existing journal literature leaves little doubt that at least some metals can be effectively removed by GFO. The goal of this project was to establish metals removal/addition by iron oxide hydroxide. As with most endeavors of this type, results ask further questions. Metals concentrations within waters of captive environments are dynamic and subject to a number of influences such as pH, ionic strength or amount and type of chelators available. Even then, extraneous factors, such as poor water motion may limit the rate of metals’ diffusion through a boundary layer. Whatever the case, supply and demand are ultimate factors. GFO (at least the brand tested) has a high affinity for phosphorus and silica and rapidly removes ortho-phosphate and silicates. Copper in the free form is removed, while ferric iron is added, though in a particulate and not soluble form. Zinc, manganese, and cobalt are also removed though concentrations never fell to critical concentrations. It is possible that the testing process reported weakly-chelated metals. Introduction of any chemical filtration could introduce competing processes in an aquarium, where the biochemical demand of animals competes with chemical extraction. No evidence was found where any element fell to critical levels. However, their initial concentrations were quite high and the salt content of water was only a fraction of natural seawater in the case of cobalt and manganese. Further simple colorimetric testing will likely lend little new useful data. More refined testing techniques will be needed before the impact of chemical filtration and its effects on metals is understood. A 20-gallon aquarium was filled with seasoned artificial seawater (from a water change). Baseline measurements were made for reactive phosphate, iron, copper, zinc, and pH. The water was then spiked with copper chloride (Certified ACS) and 99% zinc sulfate (both chelated with EDTA, though apparently not enough as some free copper was determined through testing). Coarse bubble aeration was provided by a small air pump. The aquarium was not lighted, and incident light was only that from another aquarium approximately 10 feet away. A different protocol was established in order to conduct testing for cobalt, nickel and manganese. These tests report erroneous results when magnesium concentrations exceed 300 to 400 mg/L Mg (as CaCO3). Additionally, the cobalt test is interfered by chloride (>8,000 mg/L), manganese (>25 mg/L) and sodium (>5,000 mg/L). To avoid these interferences, seasoned aquarium water was diluted with water previously treated via reverse osmosis. This water was then spiked with manganese (manganous) chloride (ACS grade; 99.5% purity) and cobalt chloride (ACS; 98.6% purity and chelated with EDTA). Baseline data were established for salinity, pH, iron, cobalt, manganese, magnesium, calcium, and alkalinity. Circulation within the tank was provided by a small powerhead (MaxiJet 400), and, as with the previous test, the aquarium was only weakly illuminated. A sample of water was tested for total iron, and an aliquot of this sample was also filtered under vacuum through a 0.45 micron filter in order to determine if iron added to the aquarium water column is dissolved or particulate. For each procedure, a fluidized bed reactor (Two Little Fishies) was filled with 60g (dry weight) Aquamaxx Phosphate Out GFO. A small water pump (Maxi-Jet 400) provided flow to the reactor which was regulated with a small ball valve to ~700 ml/min. The GFO was flushed with about 2 gallons of water before use and the reactor’s effluent appeared clear to the eye. The reactor was installed on the experiment’s aquarium and testing began. During testing for copper and zinc removal, new GFO (rinsed 60g dry material) was added after 8 hours due to a suspected saturation of the initial material (which was discarded). Most test reagents were from Hach, and results were generated through use of a colorimeter (Hach DR890) or a spectrophotometer (Hach DR2000). Glassware was cleaned with 1:1 HCL (glassware used for manganese was cleaned with nitric acid) and rinsed with deionized water. Samples were drawn directly from the aquarium with cuvettes. Zinc samples initially required dilution; de-ionized water was used. Quality assurance was conducted using a standard (Hach potable water standard). Recovery was >98% for both iron and copper and 93% for manganese. Copper, iron, manganese, and zinc were analyzed by a Hach DR890 colorimeter. Cobalt and nickel were tested by a Hach DR2000 spectrophotometer. Alkalinity was determined with a Hanna Alkalinity ‘Checker’. Salinity was measured through use of a calibrated refractometer. Silica was measured with a LaMotte Smart2 colorimeter. 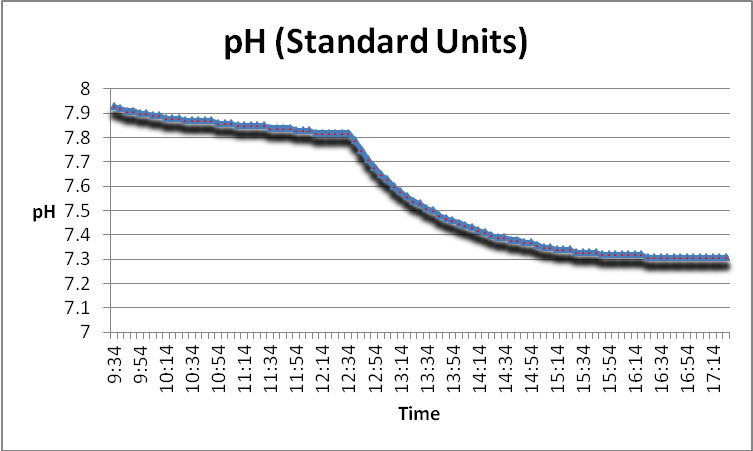 Redox (or oxidation-reduction potential) and pH were measured and recorded with a Hach HQ40d data-logger with appropriate probes. Reactive and total phosphorus (involving digestion) used Hach’s TnT reagents and a block heater with analyses performed with a Hach DR2800 spectrophotometer. These Hach reagents were used for testing: Alkalinity was determined by titration of a sample with an acid of known strength to a standardized endpoint. This method is not the most reliable for testing of seawater. However, we are not concerned with absolute values and are more interested in relative alkalinity in order to demonstrate GFO’s impact. 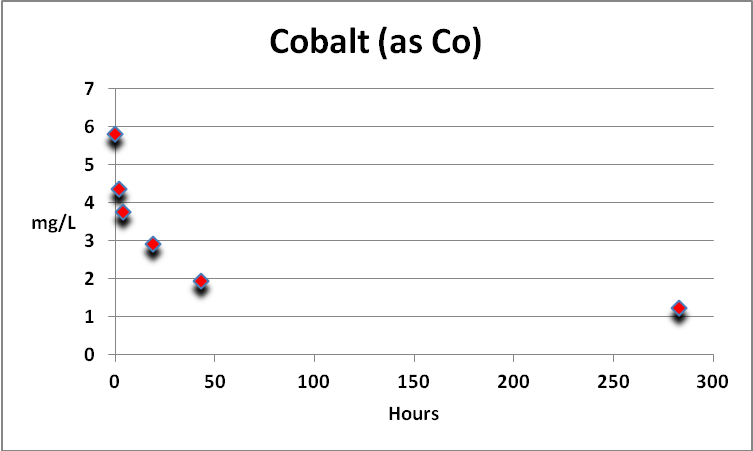 Cobalt(PAN Method; Range: 0.01 – 2.00 mg/L). Cobalt and nickel can be determined on the same sample using the PAN chemistry. Normal strength seawater must be diluted in order to properly perform this test – see ‘Nickel’ below for details. Determination is made at 620nm. A vigorous digestion was performed to determine total cobalt. Copper(Bicinchoninate Method; Range: 0.04 – 5.00 mg/L). Since copper was complexed with EDTA, free copper was initially determined. Hydrosulfite was added to the same sample for determination of total copper. Estimated Detection Limit is 0.02 mg/L as Cu. No known interferences were present. No digestion was performed. EPA approved method. Iron(FerroVer Method; Range: 0.03 – 3.00 mg/L). This reagent reacts with all soluble and most insoluble forms of iron (Fe2+ and Fe3+ as well as complexed iron) to produce soluble ferrous iron. 1,10-phenanthroline reacts with ferrous iron to produce an orange color. Estimated detection limit is 0.03 mg/L as Fe. No known interferences were present. No digestion was performed. EPA approved method. Other methods exist (using Hach’s brand names): Ferrous Iron Reagent tests for ferrous (Fe2+) iron only. 1,10-phenanthroline reacts with ferrous iron to produce an orange color. Since ferrous iron can be rapidly converted to ferric iron, samples must be analyzed immediately. 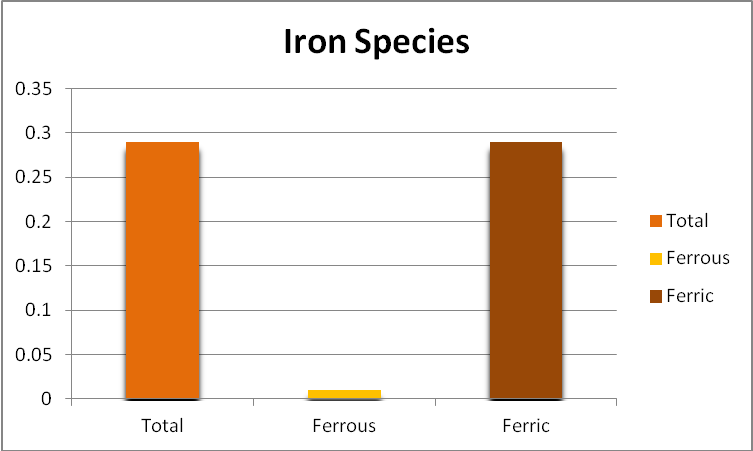 Total iron – ferrous iron = ferric iron. Manganese (PAN Method; Range: 0.006 – 0.700 mg/L). Ascorbic acid reduces all oxidized forms of Mn to Mn2+. An alkaline-cyanide reagent masks most interference. The PAN reagent (1-(2-Pyridylazo)-2-Naphthol) combines with Mn2+ to produce an orange color, which is measured with a spectrometer at 560nm. Magnesium interferes at a concentration of 300 mg/L (as CaCO3), so seawater samples must be diluted. Total manganese was determined on samples subjected to an EPA-approved vigorous digestion method. Nickel (PAN Method; Range: 0.006 – 1.000 mg/L). Analysis involves the PAN method, where the sample is buffered and any ferric iron is masked by pyrophosphate, nickel and many other metals react with 1-(2-Pyridylazo)-2-Naphthol (PAN). EDTA is added to preferentially destroy metal-PAN complexes except for nickel and cobalt. Seawater samples must be diluted since they contain many interfering elements, such as chloride (8,000 mg/l), potassium (500 mg/l), magnesium (400 mg/l) and sodium (5,000 mg/l). Spectrometric determination is made at 560nm. Phosphorus, ortho- or reactive(PhosVer3 Method). The estimated detection limit is 0.07 mg/L as PO 43- .No known interferences were present. EPA accepted method if no dilution is required. The aquarium water was tested before the procedure began – the result was 0.01 mg/l as P. pH. This parameter was monitored and recorded with a Hach HQ40d multimeter/datalogger and pH probe. The meter was calibrated to two points – 7 and 10 pH buffers were used. Silica (Heteropoly Blue Method). Reactive silica reacts with ammonium molybdate in acidic conditions to produce a yellow-green color. Since phosphate also reacts with molybdate, oxalic acid is added to prevent the interference. Silica-molybdate is then reduced by ascorbic acid to produce a blue color that can be measured through spectroscopy. These reagents were manufactured by LaMotte Company. 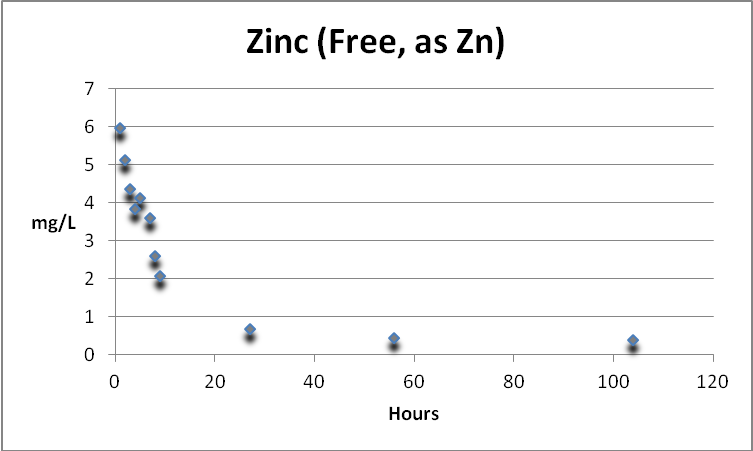 Zinc(Zincon Method; Range: 0.02 – 3.00 mg/L). This test is not listed as applicable to natural seawater since the expected concentration would fall well below the instrument’s detection limit (0.02 mg/L as Zn); however no interferences prevent its use for determination of zinc at high concentrations in brine samples. Copper and iron concentrations fell below the levels known to cause interference. Zinc (and other metals) are complexed with cyanide (hence my obsession with sample pH) and cyclohexane selectively releases zinc. The Zincon reagent (2-carboxy-2′-hydroxy-5′-sulfoforamazyl benzene) reacts with zinc to form coloration ranging from orange to blue depending upon concentration. EPA approved method. No digestion was performed. EPA approved method. Many thanks to Randy Holmes-Farley for his comments during the preparation of this article. Kanungo, S., 1994. Adsorption of cations on hydrous oxides of iron. II. Adsorption of Mn, Co, Ni, and Zn onto amorphous FeOOH from simple electrolyte solutions as well as from a complex electrolyte solution resembling seawater in major ion content. Journal of Colloid and Interface Science, 162(1), 93-102. Kanungo, S., 1994. Adsorption of cations on hydrous oxides of iron. III. Adsorption of Mn, Co, Ni, and Zn of bFeOOH from simple electrolyte solutions as well as from a complex electrolyte solution resembling seawater in major ion content. Reg. Res. Lab., Bhubaneswar, India. Journal of Colloid and Interface Science, 162(1), 103-109. Johnson, C., 1986. The regulation of trace element concentrations in river and estuarine waters contaminated with acid mine drainage: The adsorption of copper and zinc on amorphous iron oxyhydroxides. R. Sch. Mines, Imp. Coll., London, UK. Geochimica et Cosmochimica Acta, 50(11), 2433-8.